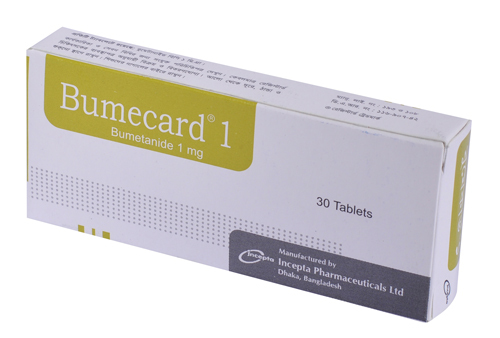 Bumecard 2 IV/IM Injection: Each 4 ml ampoule contains Bumetanide BP 2 mg.
Bumetanide is a loop diuretic with a rapid onset and short duration of action. Pharmacological and clinical studies have shown that 1 mg Bumetanide has a diuretic potency equivalent to approximately 40 mg furosemide. The major site of Bumetanide action is the ascending limb of the loop of Henle. Bumetanide inhibits sodium reabsorption in the ascending limb of the loop of Henle. Reabsorption of chloride in the ascending limb is also blocked by Bumetanide. Bumetanide may have an additional action in the proximal tubule. Since phosphate reabsorption takes place largely in the proximal tubule, phosphaturia during Bumetanide induced diuresis is indicative of this additional action. This proximal tubular activity does not seem to be related to an inhibition of carbonic anhydrase. Bumetanide does not appear to have a noticeable action on the distal tubule. 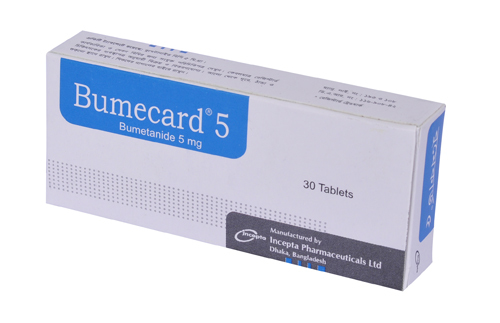 Bumecard is indicated for the treatment of edema associated with congestive heart failure, hepatic and renal disease, including the nephrotic syndrome. 1 mg in the morning , repeated after 6-8 hours if necessary, In severe cases , 5 mg daily increased by 5 mg every 12-24 hours according to response. Elderly , 500 micrograms daily may be sufficient. By IV Injection : 1-2 mg, repeated after 20 minutes if necessary. Elderly, 500 micrograms (1 ml of Bumecard) daily may be sufficient. By IV Infusion : 2-5 mg over 30-60 minutes.Elderly, 500 micrograms (1 ml of Bumecard) daily may be sufficient. By IM Injection : 1 mg initially then adjusted according to response , Elderly 500 micrograms (1 ml of Bumecard) daily may be sufficient. Paediatric use: Safety and effectiveness in paediatric patients below the age of 18 have not been established. Others (ECG changes (0.4 %), musculoskeletal pain (0.2 %), Abdominal pain (0.2 %), renal failure (0.1%), thrombocytopenia (0.2%) etc. Serum potassium should be measured periodically and potassium supplements or potassium sparing diuretics added if necessary. Pregnancy: Pregnancy Category C : There are no adequate and well controlled studies in pregnant woman . Lactation: It is not known wheather this drug is excreted in human milk.